Phillip Gellburg is a hard-working Brooklyn real estate broker who views the fact that he’s Jewish with a discomfiture bordering on paranoia. But it’s his wife Sylvia who goes off the deep end in Arthur Miller’s 1994 play “Broken Glass,” now in a run at Red Twist Theatre that’s more than metaphorically shattering. It’s November 1938, and the front pages of newspapers are splashed with reports and pictures of the spreading Nazi pogroms against Jews in Germany and Austria as they progress swiftly from violent to debasing and lethal. In Sylvia Gellburg, the news accounts, and especially the photographs, elicit acute alarm and fear – and this perfectly healthy woman becomes suddenly paralyzed, unable to walk. Is this an unconscious reaction to events taking place thousands of miles away? Maybe. But when Phillip consults with a doctor about his wife’s condition, he gets a surprising assessment: not exactly a diagnosis, but a wise observation: that family illnesses often come in twos and threes, and more people may be infected than meet the eye. The doc’s experienced truth is the launch point for a drama that peers deeply into such fundamental issues as self-respect and love, and how the breakdown of the one can derail the other. Neal Grofman and Jacqueline Grandt make a credible, volatile, tragic pair as a man flailing against the world and his heritage and a woman who senses a terrible threat she cannot freely acknowledge or describe. Grofman’s Phillip is a sober, no-nonsense fellow, practical, circumspect and humorless. When the doctor (played with mellow directness by Michael Colucci) explores a possible correlation between the oppression and Jews in Europe and Sylvia’s paralysis, Phillip reacts with impatient annoyance. And when the insightful physician suggests that Phillip might consider showing his wife more warmth and affection, the attempt quickly veers into a harrowing outburst of accusation. Suffering is a shared commodity in the Gellburg household. As the woman terrorized by remote horrors, Grandt offers a complex performance that hints at subsurface vitality in a body incapacitated. If we see this story largely through Phillip’s eyes, it is Grandt’s eloquently drawn Sylvia that mirrors his dark reality. Here is a woman bereft, indeed terrified, crippled, spiritually neutralized by something so dreadful that she can’t call it by its right name. Yet there are potential speed bumps in the drama’s course, and Redtwist’s production – directed jointly by Colucci and Jan Ellen Graves – does little to smooth them out. Unlike the exchanges between Phillip and the doctor, and Phillip and his wife, where we see a deeply troubled man awash in his self-loathing, there’s an aura of calculated setup in Arthur Miller’s treatment of other encounters. 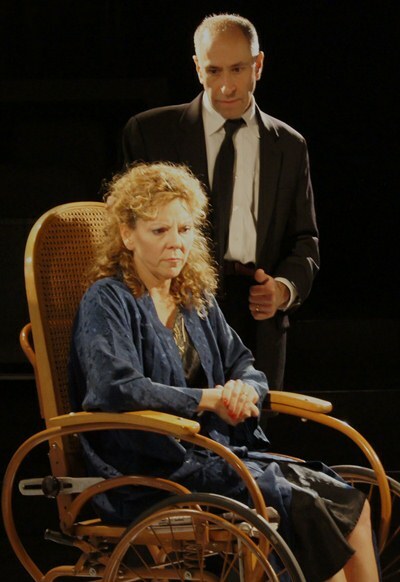 The most problematic is a scene, perhaps intended as a parallel of sorts to the conflict between Phillip and Sylvia, in which the doctor and his wife (the infectiously bright-eyed Susan Fay) get into an out-of-the-blue scrape over his history of infidelities and her present suspicions of his more-than-medical interest in Sylvia. Colucci, whose cool headed physician makes a fine foil to Grofman’s grim and angry Phillip in their interviews, is far less convincing as the strong, contained figure who elicits animal responses from desperate Sylvia. Those moments feel wooden and perfunctory. And Phillip’s apologetic, then bitter interludes with his boss at work (Mike Nowak) feel awkward and contrived. On the other hand, Robyn Okrant is a constant delight as Sylvia’s burbling sister, whose wholesome directness forces some fresh air into the world of this suffocating woman. When Okrant is in the room, the pulse of this show quickens. The compressed intimacy of Redtwist’s space magnifies the intensity of the best scenes, and designer Joe Schermoly’s practical set scheme takes advantage of this closeness, sharpening our sense of the world closing in on Sylvia. You come away from the experience with the torment of these two souls emblazoned on your mind, like a photographic flash that has caught you wide-eyed and unawares.